The implication is always that disabled people in the UK are over-privileged and should be grateful for what we get here. This shows a misunderstanding of the UN Convention as a progressive tool for rights implementation. The same day as a much criticised government strategy on disability, health and work was published, the previous Minister for Disabled People, Penny Morduant, made an announcement in her new role as Minister for International Development that the UK would be holding a global summit on disability at the end of July 2018. 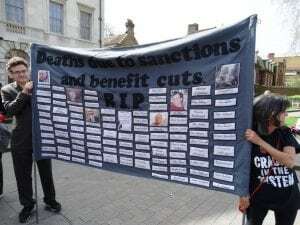 This has proved a very popular initiative with international organisations falling over themselves to be involved and the Tories are using it to its maximum to validate their self-proclaimed status as “world leaders in disability”. It is also linked to a 27m international disability development support programme and you can see from the announcement about the focus on technology companies (and opening up new markets). We obviously support better rights for all disabled people regardless of where they live but cannot let the Tories continue to pass themselves off as world leaders in disability rights when they have been found guilty of the grave and systematic violation of those rights and their policies have been called a ‘human catastrophe’ by the UN Disability Committee. Therefore we will be holding our own summit on Sunday, July 22nd with input from disabled activists from the global South. This will be near the Olympic Park although the venue is still to be confirmed. On July 24th the actual day of the summit please join us for some on-line activism. DPAC doing really good political thinking on this. Keeping it all accessible too. So important.